If you are looking for a flavorful roast recipe, look no further! This roast is so moist and delicious. 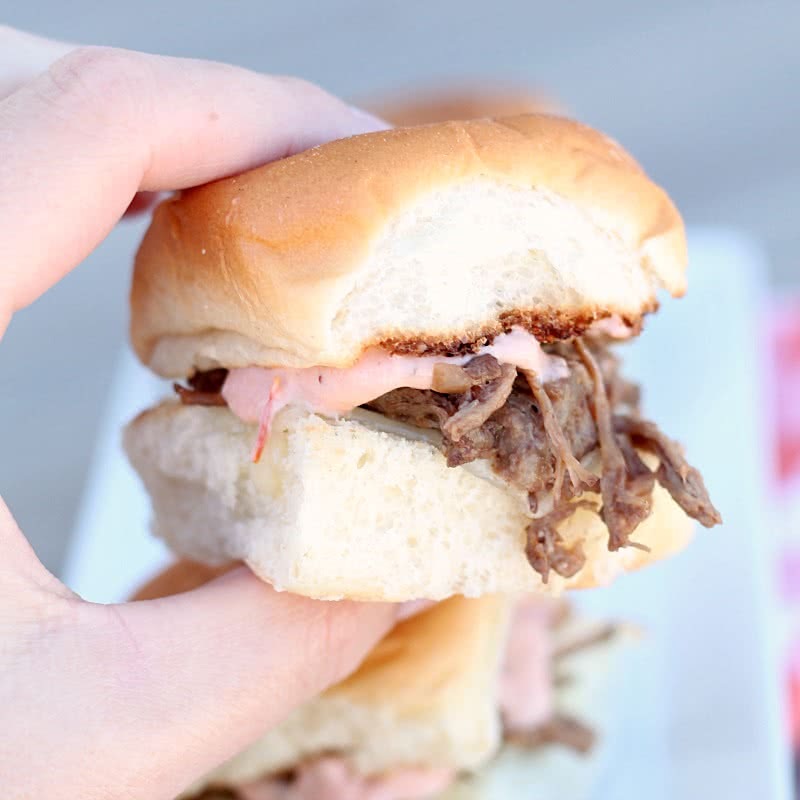 As good as this roast is, we love it even more when it is shredded and served as sliders! Flavorful roast beef topped with creamy chipotle sauce and swiss cheese on a delicious roll. Whisk together water, salsa and all 3 seasoning packets. Pour seasoning mixture over roast. Cover and cook on low for 8-10 hours, or high for 4-5 hours. Cut each roll in half and place on a baking sheet. Place a slice of Swiss cheese on the bottom half of each roll. Place a spoonful of shredded beef on top of each roll with swiss cheese on it. Mix sour cream, chili sauce and horseradish sauce until well combined and spread on the top half of each roll. Assemble each slider by placing the top half of the roll on top of the bottom. This is making me so hungry right now! Recipe looks good! We also have six daughters,ages 10-34. They are all very close as well. We, however, also have four sons...so a little different family chemistry! Can I make this ahead of time and freeze it? I want to bring it for a trip but don't want to bring the crockpot? Yes, this recipe freezes great! That sounds delicious ... and I love the idea of the Chipotle Sauce. Thanks so much for sharing. I'm pinning it! I'm sorry, but how can you call it chipotle sauce if it doesn't actually have chipotle in it? I would just put Cholula Chipotle sauce mixed in with sour cream. :/ Other than that, the recipe sounds delish!!! lol Thanks for clarifying. I had the same question....and would definitely prefer the spicier version. The recipe sounds good, though! Thank you for sharing. What is chili sauce? I'm not sure where to find it? Could I use chili powder? Chili sauce is found next to the ketchup. It's basically ketchup with a "kick". This was so easy and so good. Not quite sure why the cup of water though...Will do about 1/4-1/2 cup next time to see how that works. The "chipotle" sauce was really good and I am not a spicy person. Not a swiss person either so I used provolone but DH used swiss. Super easy and delish! Will be making in my CP to take to Nascar this year! Found this on Pinterest and made it today. LOVED it! I also love your site. I have four other sisters so I understand how much love there is to share. Thanks so much for sharing this recipe. sounds delicious... can anyone comment as to saltiness? My DH mentioned it seemed it might be, what with an enevelope each of the 3 ingreds, with just 1 cup of water. Thoughts? I wondered the same thing. First thing I thought when reading the ingred list. I know onion soup and italian seasoning and au jous packets are all sky high in sodium. The first time I cooked this it was really salty so this time I only used 1/2 of the envelopes, we'll see. I thought I should come back with an update...I did add the potato to the crockpot and then about another 3/4 cup of water and it seemed to help quite a bit. Still salty, but not nearly as bad. I also went ahead and took some of the juices out of the pot, made a roux and then added the juices to make a thicker gravy. My husband prefers it that way. So all in all, I think the meal is saved. I'm wondering what brand of Italian dressing mix you all use? I'm wondering if that is the problem? I'm using Good Seasons Zesty Italian. I used it in another recipe (Italian Chicken) and thought that one was rather salty as well. Maybe I need to find another brand? or some other substitute?? I am sorry yours came out so salty. I just use my generic store brand Italian Seasoning. That may be the problem? I meant that I use the generic store brand Italian dressing mix. Don't use Zesty Italian. They make a regular italian packet located right next to the zesty..
oh yum! I just saw this on pinterest, repinned and will be making it tomorrow. Thanks for sharing! I just made this. My daughter has already tried it and says it is perfect!! I used the regular Italian dressing packet not the zesty and it is not salty tasting. I used the store bought Kraft Chipotle Mayo and she said it was fine but wants to try the making the sauce in the recipe next time. YUMMY!! Thanks for the recipe. I made this last night for supper, and it was yummy. I didn't use "store bought" onion soup mix, but my homemade version and I didn't think it was salty. I might make the sauce a little spicier next time or maybe use a hot salsa. I serve them with carmelized onions. They were super messy - finger lickin' good! I believe this will become my standby potroast recipe as well. Made this tonight, its yummy but I didnt do it as sliders I made some mexican rice and put it all on a tortilla! Watch out taco bell! Found this recipe on Pinterest and love, love, love it. I'm not always a fan of pot roast because it is usually on the dry side and needs a boost of flavor. This is delicious and full of flavor. I will definitely be making this in the future. how many servings does this make? I need to make for about 10-11! but I want to make sure there will be enough! suggestions? It makes about 12-15 sliders. It depends on the size of your roast and how much meat you put on each sandwich. If you got a bigger roast it would go further. There is enough liquid that it wouldn't dry out. Hope this helps! After the meat is shredded, do I put it back in the gravy before making the sliders? Yes, just put the meat back in and use a slotted spoon to put it on each slider. Thanks! I agree with Corey...this was waaaaay too salty. Whoooo! It had great flavor and the meat was falling apart tender...I just shredded it with two forks right inside the crock...but the salt factor was overwhelming. I want to make this again, but would like suggestions on how to minimize the salt. Anybody? Even my picky 5 year-old liked this one. I made this yesterday and it was so good! Easy and scrumptious!! I used adobo sauce instead of chili sauce and the combination of everything really mellowed out the heat! I will be making this again for sure!! Has anyone tried this with a pork roast? I have one in my freezer and I'm looking for a good recipe for it. My husband HATES traditional pot roast (Mom made it way too much when he was a kid), so I need something to wow him. Thoughts? I made this for dinner tonight and it was delicious!!! I used regular size hawaiian buns and mozzarella cheese. I didn't think it was too salty. I used store brand onion soup mix and Italian dressing mix. The au jus wasn't store brand but it was a cheapy brand. I made this tonight and it was delish! I'm not much of a meat eater and was pleasantly surprised! We didn't do the sandwiches, we just sliced up the meat and served it up. Thanks, girls, for sharing! Just made these. Left my pot roast in the slow cooker for about 10 hours. The longer the better as it just falls apart. Instead of the 3 packets I simply used McCormicks pot roast seasoning pack since that is what I always use. THESE WERE DELICIOUS!!!!!!!! I used the 3 packets, salsa, and added a little more water than called for. For the sauce I mixed equal parts mayo and sour cream and added a few squirts of sriracha. The sauce on the sliders was excellent! These were soooo good!!! I forgot to get salsa, so I just used a small can of tomato sauce, plus I threw in a sliced onion. The sauce is super yummy and I don't know how people thought they were too salty, I actually ended up adding more salt after shredding the beef. My super picky 5 year old even loved them, so this recipe is definitely a keeper!! What type of roast do you recommend? We have used all kinds. Sirloin tip was yummy. Some of the fatter cuts turn out very moist. If you have a favorite type of roast you may want to stick with that. Thanks for the question. Hope it helps. I just made this tonight and it was wonderful! I made this tonight for dinner. DELISH!!!!!!!!! Thanks for sharing with us! I made this as one of my freezer meals. Prepared the sauce and poured over meat, then froze. I cooked it last night and it was simply A-M-A-Z-I-N-G!!! So delicious! IF (BIG IF--haha) you have leftovers, which we had a little, we made omelets the next morning with the meat. Oh, melt in your mouth goodness. I made these on Friday night for my mother in law's birthday dinner. They were absolutely delicious! Everyone raved over them, and were surprised they actually liked the sauce on top. Very good as leftovers at work today as well. Thank you, this recipe is a keeper! This was good. But very Salty!!! I would want to make this again, But.... How would you cut down on the Salt???? One reply from the blogger states ?I just use my generic store brand Italian Seasoning.? That?s very different from a packet of Italian dressing mix? Also could try using low sodium beef broth instead of the water and packet of au jus? Someone else replies to use 1/2 of each packet. I think I will try the low sodum beef broth. We LOVE this & make it often. One question - what do you recommend as a veggie side dish? Thanks so much! Just go to the home page on our blog and then click on categories. Scroll down to side dishes and vegetables. 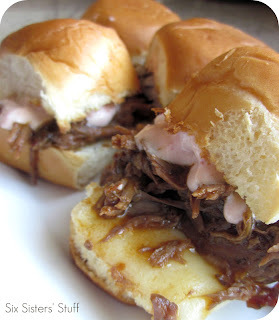 There are so many potato and vegetable dishes that would go great with these pot roast sliders. The salad category is full of great sidedishes too. The first time I tried this recipe was for New Years Day dinner. I did not use the suggested envelopes but made my own. Turned out GREAT. My 10 and 8 year old loves it!! I just made these for Christmas dinner, and they were oh so good! The family loved them. Yes the juices were on the salty side but I didn't keep the meat in all of the juices after shredding. I actually took most of the juices out and left just enough in the crockpot with the beef to keep it moist while it continued warming. Was delish! I'm making them again for a potluck with our friends! Thanks so much for sharing. I've made this several times and it's always a hit. In fact, during potlucks, it is often requested. For the chipotle sauce, Fresh & Easy has an awesome chipotle grilling glaze that I just mix in with some sour cream and it's delicious. I made this for the family during Christmas... HUGE hit! I've had relatives asking for the recipe ever since. Gave this recipe a whirl today and was amazed how good it tasted. Even better it took two minutes to put together. It is a keeper! I've made this recipe several times!! It's absolutely delicious! It freezes well. I love to eat it on a roll but my favorite way is over white rice! I have made this 20 times. On mini rolls but I prefer over jasmine rice. Soooooooooooo good!! Thank you! This recipe sounds sogood. I dohave venison and pork in the freezer. I will make one of these roast with this recipe. BTW, I love spicy and horseradish also. Thinking about trying it with chicken. Asfor salty, look on the envelopes and see what spices are inside. Make a combination of your own from these spices and cut down on the salt. If your like my daughter, you have an abundant selection of spices already in your cabinet to do the same job as the packets. Hope you give it a try. I made this tonight and everyone complained it was way too salty even though it smelled heavenly. I wonder if you could tell me what size/weight 'envelopes' of each of the powder mixes I should have used. The only au jus mix I could find was Knorr brand and it was bigger than a typical envelope. That may be why it was so salty:/ listing the weights/sizes (or preferred brand) of the envelopes could be helpful to avoid the over saltiness. Loved the sour cream chipotle sauce with it:) I do love your stuff though and have a weeks' worth of your recipes lined up to make!! We used a 1 ounce McCormick Au Jus packet. I have made this many times, and my family loves it! Even my super picky eater loves it. We don't think it is too salty, but we don't usually put juice on top of our meat since we don't really like soggy sandwiches. My Autistic son freaks out if the sandwich falls apart, so we use the King's Hawaaim sub rolls, and toast Provolone cheese on them. We've mad it with store brand onion soup mix, as well as Liptons. I even made my own soup mix last time because we didn't have any. We don't always use the chipotle sauce since it is th only thing we ever use horseradish sauce in. I'm making it for my extended family tonight. I can't wait!! The whole family loved this--it was tasty!